Apoderarse de su taza de Java y pasear por el muelle privado. La experiencia de la soledad de la mañana de esta maravillosa bahía. Prepárese para un día lleno de diversión ... La playa es donde está en ..... 145ft de costa de arena limpia. Hay espacio para toda la familia en la casa de playa de 3 dormitorios y 2 baños que tiene capacidad para 8 personas, ubicada a solo unos pasos del muelle y la playa. Disfrutar de una cena en la terraza frente al mar. Esta propiedad no tiene escasez de aparcamiento para vehículos, remolques de embarcaciones y vehículos de recreo. Dentro de la casa de la playa se puede disfrutar de sus comidas en la comodidad fresca de la zona de estar con aire acondicionado o la sustrae a la terraza frente al mar. El patio frontal incluye una barbacoa y pozo de fuego justo al lado de la playa. Utilice la cabaña para ocultar formar el sol y leer su novela favorita. o dormir la noche aquí y contar las estrellas. La casa de playa ofrece una amplia zona de césped con espacio para el bádminton o bochas. Disfrute del vibrante espectáculo de flores y la maravillosa vegetación que rodea esta propiedad. Disfrute de una ronda de golf en el famoso campo de oro de Shuswap Lake Estates. Gran muelle c / w látigos para atar y una boya para su uso. Great property right on the water with lovely sunsets and lots of room inside. Nice to stay there over Thanksgiving and enjoy the morning and evening views. Even opportunity to have a fire by the beach though in the end we didn’t have time. Overall very nice property. We booked the yurt too and it was a neat experience. Tim was very responsive to our needs. Thank you Dave for your kind remarks. I have to admit I was a little skeptical about having a hockey team stay here. Your group where great. You left the house really nice and it was fun to see the kids enjoying the Yurt. Tim’s beach house was comfortable, spacious and equippped with everything you need in the perfect location. With a beautiful view and a great deck to enjoy it on. Tim was friendly, kind and welcoming to our family and was willing to help us sort out launching and docking our boat. Couldn’t have asked for more! Fantastic beach front location and close to all amenities. House was well equipped. Extras included a fully stocked kitchen, very comfortable beds, multiple kayaks and the use of the dock and private buoy. Views are amazing from the upper deck. Evenings sunsets on the lower deck by the fire were also breathtaking. Satellite radio and surround sound patio speakers added to the atmosphere. The adjacent establishment, Finz, is fun and serves amazing pizza. 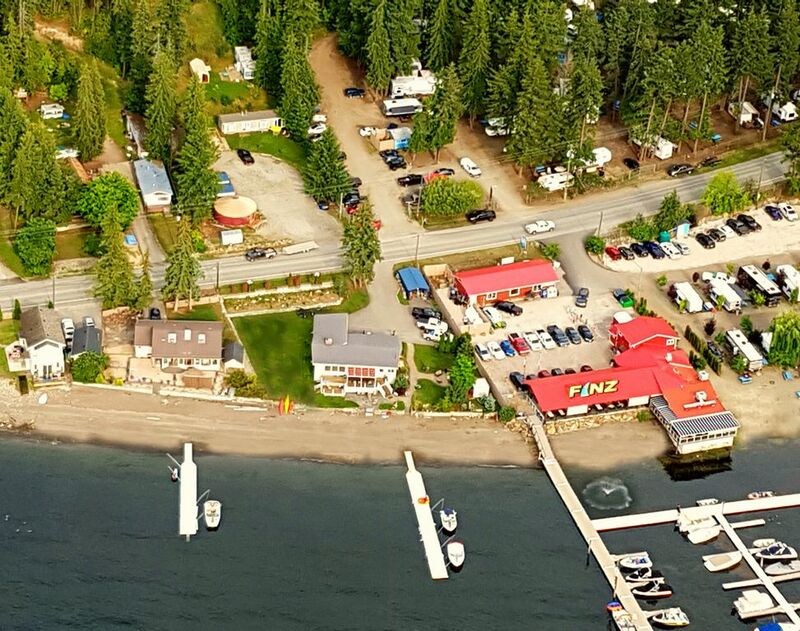 Gas is also conveniently located on the dock at Finz to ensure there is no lost boating time. You guys where great travelers. It was so nice to see you enjoying the property and the amenties of Blind Bay. And you didn't have to but thank you for getting those loads in the wash. Made the turn around go a lot faster. I hope you and the family got lots of surfing in on your new boat, its a beauty by the way. This property certainly helped make our vacation great. With 6 adults, 2 children and an infant, there was plenty of comfortable beds/rooms. Tim was the perfect owner. He lives across the street and was available for any request or issue and always concerned for our enjoyment and safety. Located on the beach, perfect for swimming and using the available kayaks and water bike. The property had plenty of space for kids playing on one side and quiet time on the other. There was still a sitting area in the front with the beach and a large covered deck at the back with a dining table that easily sat 8. There was a dock that would easily accommodate your boat or sea-do’s. In the house it was nice to have one big room for sitting, dining, and kitchen which allowed everyone inside if by some chance the weather wasn’t cooperative. The kitchen was fully stocked with everything you could need. The inside was clean and the A/C had the home cool when we arrived. A grocery store just down the street made stocking up on food and liquor easy and Finz Restaurant next door provided us with great pizza one night. The music at the bar next door was never a problem. We would not hesitate to recommend Tim’s Blind Bay property for a fun relaxing place to stay on the beach. Thank You Carol for your kind words. It was my pleasure to see your family and the children enjoying the property. It was truly my pleasure. It would be a winderful thing to see you again next year, maybe I can give you a break on the rate. Let me know if your at all interested. Perfect Location on the water! Tim met with us and made sure we were familiar with the home. He has plenty of space to set up bocce ball, badminton and ladder ball. Plenty of space for guest parking, and a well equipped kitchen. Nice flat lot right on the water! Conveniently located close to a restaurant and a grocery store within walking distance. House was clean, and beds had nice sheets and lots of extra blankets/towels. I would highly recommend Tim’s home to anyone looking for a place in the Shuswap. Thank you Tim, for the opportunity of staying in your rental. Your family was a joy to have on the property. Thank you Leah for looking out and watering all the new flowers. It was really nice to have you appreciate them so much. Please come back again and enjoy the rest of the summer. Spent a week at Tim's house with family, it was a GREAT place to accommodate our group (4 adults + 3 kids), more than enough space for us. House is stocked with everything you could ever need, was a bonus to have a washer/dryer to use as well (came in handy with 3 kids!). Cant beat the location, close to many amenities. Wish we had a boat but could have rented one next door of we really wanted to. Awesome vacation spot, definitely recommend this place! Its great to see families come together and enjoy themselves at the lake.